I'm not fond of store bought grated cheese. We prefer the extra sharp block cheese and I grate my own. We love cheese and have it about every day. When I realized that we were washing the grater just about every day, I decided I would grate enough to last the whole week and put it in an air tight container. It stays fresh and it's so convenient to use. I have been doing this for several years. Now see what you've done. You've made me very hungry. 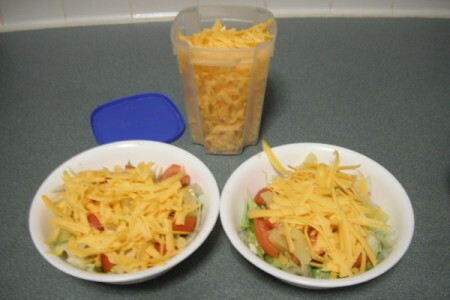 The salads look delicious. When drones are as commonplace as telephones, you can just zip me one over. I'm in the Piedmont. I love cheese, too. Are you not bothered by the high sodium content? I tried Swiss because it was about the lowest in sodium. Reminded me of tasteless rubber. Hint: If you don't around to eating all that cheese you can stop it from getting moldy by putting a small dab of paper towel drenched in white vinegar in the container and it will prevent mold. I agree with Gloria - I do that [drenching a corner of a paper towel in white vinegar'] all of the time and my cheeses never gets moldy now. I don't have any problem with cheese molding. We don't keep it that long. Good idea though. Thanks for sharing. Actually, the top picture shows up as us eating a lot of cheese. I actually was making potato soup that day to take to a friend who had come home from the hospital. One small container, as shown in the 2nd picture, will last us a week or two depending on how many salads we eat and how often I fix potatoes with onions and cheese, a recipe I have posted on Thriftyfun. Cheese never lasts long enough at our house to go mouldy either:) I grate my own parmesan - the taste is amazing! I had not thought about grating Parmesan. Good idea!! 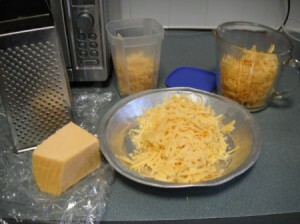 I can find all types of grated cheese in both coarse and fine shred, except for American. I prefer American on omelettes. So, I buy American Deluxe slices that are not individually wrapped. I put the whole pack in the freezer and freeze it solid. Then I grate it just before it begins to thaw. Perfect! Then I return it to the freezer, being careful not to pack it down. I use a fork to transfer some to my hot scrambled eggs. Good.